It's always fun to celebrate when a new website is launched! 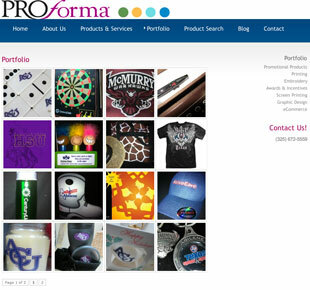 Today we made the new Proforma Promotions Group website live at www.proformapg.com. The website was built with WordPress using the Blitz commercial theme. We worked extensively with our clients to customize the theme for their company. One of the biggest changes we made was with the Portfolio pages. Everyone loves pictures, so we setup the Portfolio page to highlight as many examples of their work as possible! You can see the final results here. The website is setup so that our client can easily update and maintain the site themselves. Now, don't you want one for yourself?